Nothing is impossible on a Heinkel car; it’s really just a question of time and money. If you picture the seats as their own mini project, and are willing to learn and take some time, you can get the results you want. What I learned was that it was best to outsource my seat covering to my wife! She has excellent skills and high standards, so who better to do it? 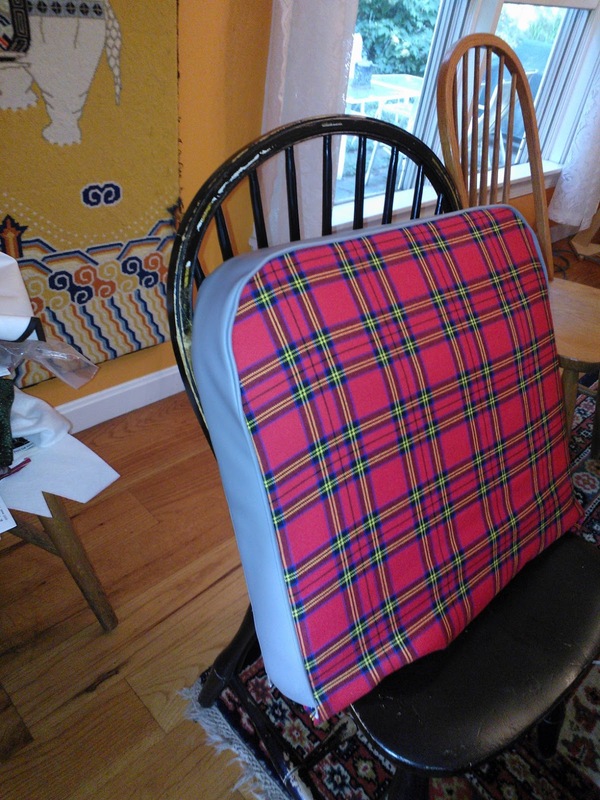 While we’d saved the fabric from the old seats, we really couldn't make an exact pattern from them. The assembly and dimensions were really just a point of departure, since we were using 2” of foam and ½” of batting rather than an inch thick sandwich of the original items. Besides, the original seat covers were disgusting to the touch and the cats and dog spent a lot of time sniffing them, never a good sign. I resorted to a measured drawing of the seat cover components and we worked from there. The first step was to choose the vinyl material. Once again, my friend Dan was instrumental in this choice. I also decided to use the same vinyl to cover the paperboard car interior components to have a nice matching look. I purchased 5 yards of 54” wide “Light Slate” Vista Hide Fabric (#VH7613). To facilitate attaching we had to cut 3" corners out of the foam. On the original seat bottom the fabric was tucked down into these areas and attached underneath. To keep it authentic looking we did the same thing. 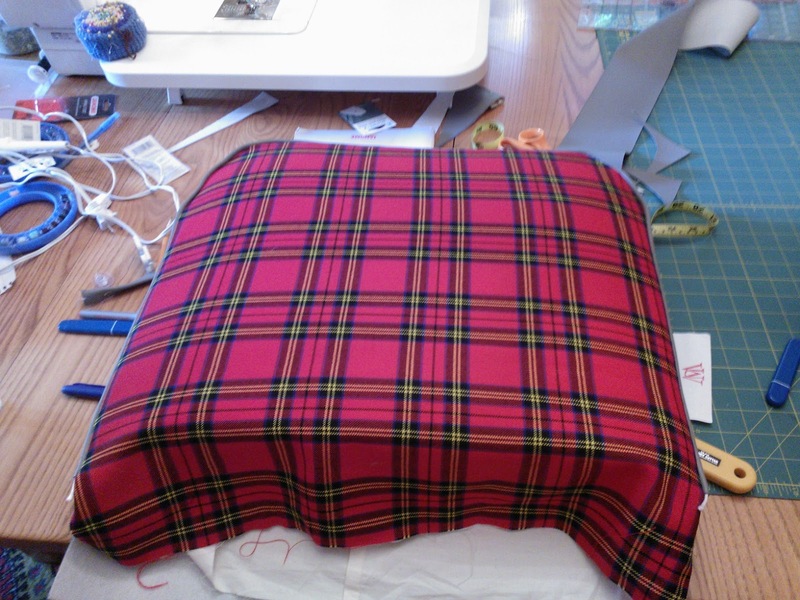 Because we had just enough red tartan material, my wife made an entire test covering of old sheets. She cut and sewed the material as if it was each piece of the final product (except for the piping) to confirm the dimensions of the final coverings. 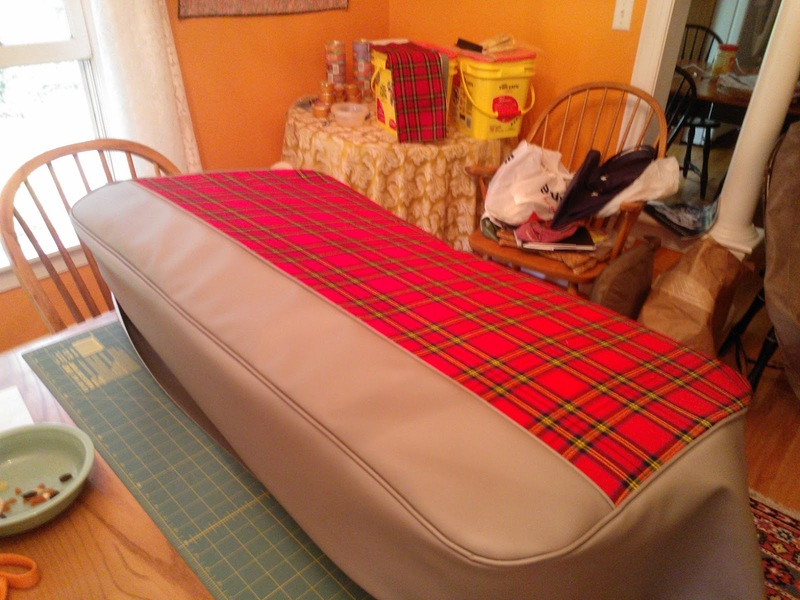 Once we were satisfied we had enough red plaid and could cut it in a way that all the pieces lined up properly, she cut the muslin underlayment for the tartan. The wool fabric we were using was very sheer, and we felt that this would help the final red fabric covering lay flat. 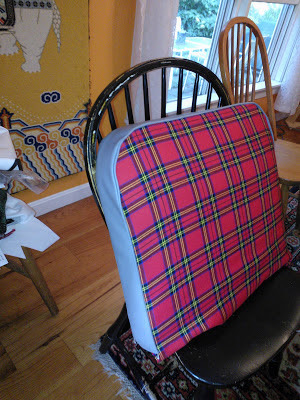 The bottom seat cover has 4 components: The fabric facing (tartan red in my case), the piping around the cushion edge and where the fabric facing meets the vinyl, the backs, and the attachment points to the frame. The trickiest parts are the piping and the sleeves. We used 1/8” cording string from the fabric store as the basis for the piping. To make piping you lay the string flat, wrap the vinyl fabric around it, then sew close to the string.You should use the special "piping foot" for your sewing machine to get the best results. 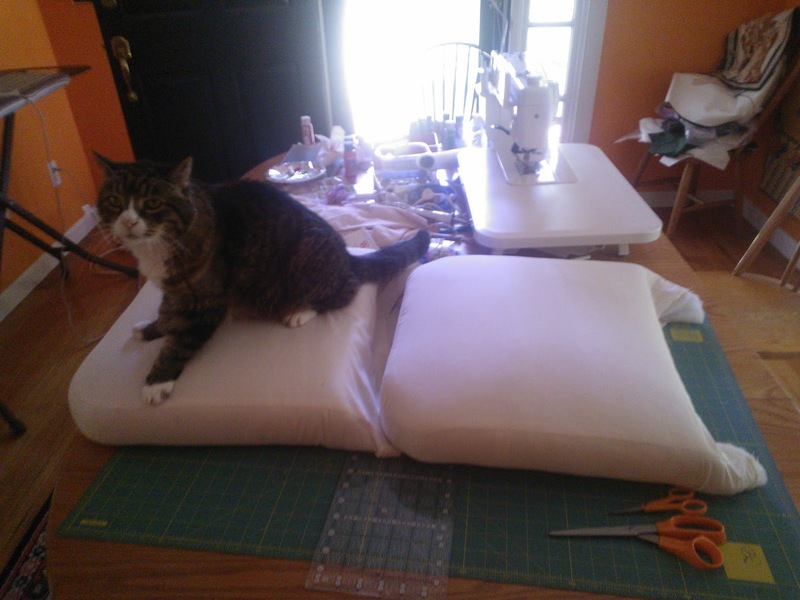 You need a way to attach the entire seat fabric and foam assembly to frame. The original seat fabric attachment method was to wrap the fabric around a lip on the seat frame, and then secure everything with a u-shaped toothed upholstery clip. In my case I had two layers of high quality vinyl that was much too thick for this method. Plus, the clips would show, and I thought it would look poorly. So, we had to devise another method. To do this my wife made the vinyl edge pieces about 4-6 inches longer than what you would see, and sewed a sleeve on the ends. We took a 1/4 “metal rod and inserted it into the sleeve. We then aligned the fabric on the seat face, pulled it around and under, and attached the metal rod to the frame using zip ties. Hog ties are traditionally used in auto upholstery, but I could not get them as tight like I could with zip ties. For the seatback we used the original approach of making a sleeve and pulling it over the seat frame. First we sewed the foam and batting together, and then to the seat back. The original seat was done this way, presumably to keep it from sagging. 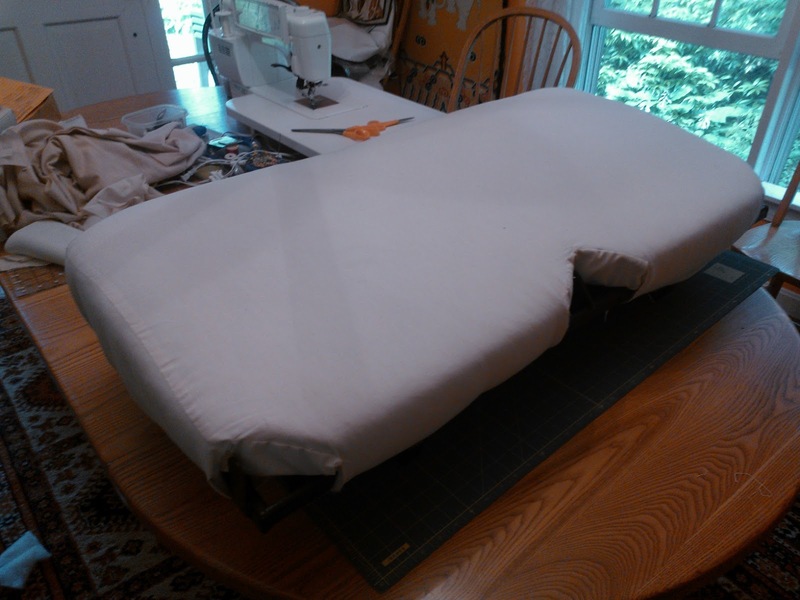 Once the muslin sleeve and final sleeves were pulled over the frame, we folded the fabric around the frame bottom and attached it with clips I saved from the original seats. I cleaned and repainted the original clips; I thought I wouldn't be able to find any that could hold the layers of fabric around the 3/4' tubular frame. Later I did find some on line (now I just can't remember where!). Once the seats are completed they can installed in the car. I found it easier to assemble the entire seat and install it. It is difficult to get access to the side bolts once the seat is in the car.